Figure 1. Hypertension Intervention Nurse Telemedicine Study recruitment flowchart. BP indicates blood pressure. *Patients no longer receiving care at Durham, North Carolina, Veterans Affairs clinics; residing in a nursing home; receiving hemodialysis; having creatinine levels higher than 2.5 mg/dL (221 μmol/L); or diagnosed as having dementia. Figure 2. Estimated proportion in blood pressure (BP) control from baseline to 18 months, by intervention group. Bars represent 95% confidence intervals (CIs). The estimates and 95% CIs are marginalized probabilities from a logistic mixed effects model and were calculated using predict statements in PROC NLMIXED statistical software (version 9.2; SAS Institute Inc, Cary, North Carolina). The model estimated intrapatient correlation was 0.39. Figure 3. Estimated systolic blood pressure (BP) from baseline to 18 months, by intervention group. Bars represent 95% confidence intervals. Estimates are based on a longitudinal data model with unstructured covariance matrix. The model-estimated systolic BP correlation between time points ranged from 0.24 (at baseline and 18 months) to 0.41 (at 6 and 18 months). Figure 4. Estimated systolic blood pressure (BP) from baseline to 18 months, by intervention group, for 241 patients with inadequate baseline BP Control. Bars represent 95% confidence intervals. Estimates are based on a longitudinal data model with unstructured covariance matrix. The model-estimated systolic BP correlation between time points ranged from 0.28 (at baseline and 18 months) to 0.43 (at 6 and 18 months). eTables and eFigure -Download PDF (63 KB). This file requires Adobe Reader®. Background To determine which of 3 interventions was most effective in improving blood pressure (BP) control, we performed a 4-arm randomized trial with 18-month follow-up at the primary care clinics at a Veterans Affairs Medical Center. Methods Eligible patients were randomized to either usual care or 1 of 3 telephone-based intervention groups: (1) nurse-administered behavioral management, (2) nurse- and physician-administered medication management, or (3) a combination of both. Of the 1551 eligible patients, 593 individuals were randomized; 48% were African American. The intervention telephone calls were triggered based on home BP values transmitted via telemonitoring devices. Behavioral management involved promotion of health behaviors. Medication management involved adjustment of medications by a study physician and nurse based on hypertension treatment guidelines. Results The primary outcome was change in BP control measured at 6-month intervals over 18 months. Both the behavioral management and medication management alone showed significant improvements at 12 months—12.8% (95% confidence interval [CI], 1.6%-24.1%) and 12.5% (95% CI, 1.3%-23.6%), respectively—but not at 18 months. In subgroup analyses, among those with poor baseline BP control, systolic BP decreased in the combined intervention group by 14.8 mm Hg (95% CI, −21.8 to −7.8 mm Hg) at 12 months and 8.0 mm Hg (95% CI, −15.5 to −0.5 mm Hg) at 18 months, relative to usual care. Conclusions Overall intervention effects were moderate, but among individuals with poor BP control at baseline, the effects were larger. This study indicates the importance of identifying individuals most likely to benefit from potentially resource intensive programs. Improving the rate of blood pressure (BP) control may require expanding the model of care delivery beyond the traditional clinic-based physician visits. Interventions that use home BP telemonitoring linked with patient feedback and medication titration may enhance access and improve outcomes for adults with hypertension. 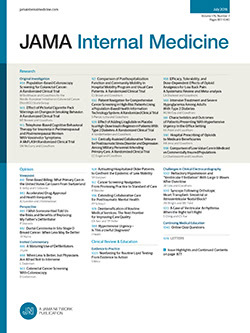 Prior interventions have shown a benefit using this model up to 12 months in highly selected patients, with few racial minorities, and with most patients prescribed fewer than 2 antihypertensive medications at enrollment.1,2 It is not known whether these results apply to a racially diverse primary care population with limited resources and more aggressive medication regimens or whether treatment effects are sustained beyond 12 months. Home BP telemonitoring may improve the quality of decision making and provide the ongoing surveillance required for timely interventions for poor BP control, although it may be more resource intensive than traditional clinic visits.3,4 Home BP measurements are predictive of target organ damage and may reduce unnecessary treatment of “white-coat hypertension” (high BP in office and normal BP out of the office).5-7 Home BP telemonitoring is also consistent with the patient-centered medical home (PCMH) model of health care.8 The PCMH seeks to retain the primacy of an ongoing relationship between patients and primary care providers but also to support this relationship by using nonphysician team members in the systematic processes for non–clinic-based care. Improving current hypertension control rates may require new methods of care delivery that can be applied to primary care populations and are consistent with the PCMH. However, few elements of PCMH have been tested, and there have been calls for more rigorous evaluation.9 Furthermore, it is becoming increasingly important to identify individuals who are most likely to benefit from these programs given increasingly scarce resources. This randomized clinical trial evaluates novel hypertension treatment delivery methods based on home telemonitoring of BP and tests to determine which of 3 interventions delivered via telephone was most effective in improving BP control. The Hypertension Intervention Nurse Telemedicine Study (HINTS) trial evaluated 3 telephone-based interventions in a 4-group design: (1) nurse-administered, behavioral management intervention; (2) nurse-administered, physician-directed medication management intervention using a validated clinical decision support system; (3) combined behavioral management and medication management intervention; and (4) usual care. Potentially eligible individuals were selected from among primary care patients in Durham, North Carolina, Veterans Affairs (VA) general internal medicine clinics (VAMC). Eligible patients had a diagnosis of hypertension, were using a BP-lowering medication, and had inadequate BP control (>140/90 mm Hg for all patients) based on the average of the prior 12 months of clinic BP recordings obtained from electronic medical records. We excluded patients who received hemodialysis; had a serum creatinine level greater than 2.5 mg/dL (221 μmol/L) or no documentation of renal function; had ever had an organ transplant; had been hospitalized for stroke, myocardial infarction, or coronary artery revascularization within 3 months of contact; had a diagnosis of metastatic cancer or dementia; did not have a home telephone; resided in a nursing home; received home health care; or had severely impaired hearing or speech. A research assistant sent recruitment letters to eligible patients, contacted patients by telephone, and arranged an in-person meeting at the patient's next primary care provider visit to obtain informed consent and conduct a baseline interview. Consenting patients were then randomized to 1 of the 4 arms using consecutively numbered envelopes; randomization was stratified by diabetic status. Participants were reimbursed $10 for the baseline visit and the 3 subsequent 6-month BP measurements ($40 total). The Durham VAMC institutional review board approved this study. All patients randomized to an intervention arm were provided a wireless home BP monitor (model UA-767PC; A&D Medical Digital Blood Pressure, Tokyo, Japan) and telemedicine device (model 102; Carematix Inc, Chicago, Illinois) and advised to measure their BP once every other day. The telemedicine device connected to a telephone line like an answering machine. Patients' BP measurements were transmitted automatically to a secure server.10 Because BP measured at home averages 6 to 8 mm Hg and 5 to 6 mm Hg lower than values obtained during a routine clinic visit for systolic and diastolic BP, respectively,11 we designed intervention trigger alerts based on a 2-week average home BP of 135/85 mm Hg mm for those without diabetes mellitus (DM).12 However, because an internal expert panel raised concerns about reducing diastolic BP too low with home BP values for those without DM, intervention trigger alerts were based on a 2-week home BP average of at least 135/80 mm Hg for patients with DM. If an intervention was activated, a patient's home BP was reassessed again at 6 weeks before triggering the intervention again. If 3 BP values were not transmitted over a 2-week period, a research assistant contacted patients to remind them to use the equipment and to answer any potential technical questions regarding the equipment. A mean home BP measurement that exceeded the threshold over this interval triggered 1 of 3 assigned interventions (eFigure). Patients who maintained adequate BP control did not activate the intervention but triggered a contact every 6 months to reinforce their positive behavior. A safety alert was activated if 2 consecutive home BP measurements recorded at least 12 hours apart were greater than 175/105 mm Hg. In this instance, a nurse contacted the patient and initiated an approved safety protocol. The behavioral management intervention consisted of 11 tailored health behavior modules focused on improving hypertension self-management as noted in eTable 1.13 The behaviors addressed in the intervention included hypertension knowledge, including medication adverse effects and medication memory; resources to improve health care access; and the patient–health care provider relationship. Patients were also provided evidence-based recommendations regarding hypertension-related behaviors, including salt intake, weight, stress reduction, smoking cessation, and alcohol use. Verbal information was reinforced with mailed handouts. The nurse used an intervention software application that contained predetermined scripts and patient-specific tailored algorithms for the modules. Each encounter consisted of 3 or 4 modules and lasted 12 to 14 minutes. On triggers in the medication management intervention, a nurse notified a study physician and provided the physician with a medication change recommendation based on the decision support software.14 The study physician reviewed the patient's BP, medication, and adherence (based on patient report and prescription refill data) with the nurse and decided whether to change hypertension medication. The nurse communicated recommended changes to the patient, while the study physician electronically prescribed the medication and generated a note in the patient's medical record that was cosigned by the patient's primary care physician. The nurse called the patient 3 weeks after the medication change to obtain reports of adverse effects and address patient questions. In this arm, patients received the full dose of each intervention. The nurse initially addressed recommended medication adjustments using the established method described in the previous subsection, followed by the tailored behavioral intervention. Patients in all 4 study arms received primary care and management of hypertension according to the discretion of their primary care provider. Patients treated with usual care received no contact with the intervention nurses and did not receive home telemonitoring equipment. We conducted the cost analysis from the perspective of the VA health care system, including both direct and indirect costs of the intervention. Resource utilization costs were derived from the VA's DSS National Data Extract inpatient and outpatient files.19 We examined outpatient utilization counts (primary and specialty care) and aggregated inpatient and outpatient costs to obtain total VA resource utilization costs. Sample size estimation was based on the primary hypothesis that patients randomized to an intervention arm would have improved BP control at 18 months compared with the usual care group. A common intercept and a linear change in BP control were assumed, so the comparison was a difference in slopes (the treatment by time interaction in a logistic mixed-effects regression model). Sample size and power estimates were generated empirically via a simulation study using PROC NLMIXED statistical software (version 9.2; SAS Institute Inc, Cary, North Carolina). From previous studies13,20 baseline BP control at a single measurement was estimated as 30% and the 18-month dropout rate as 15%. The random intercept variance component was assumed to be 1.7 (equivalent to a patient intraclass correlation of 0.34).21 To detect a difference in slopes resulting in a 15% improvement in BP control at 18 months relative to the control group (ie, 45% vs 30%) with 80% power and a type-I error rate of 5%, 600 patients were needed. For the secondary analyses, we examined the intervention group effect on mean systolic and diastolic BPs over time. We used longitudinal data analysis models with an unstructured covariance to account for the correlation of patients' repeated measurements over time (using PROC MIXED software). The outcome variable in these models was the study BP at baseline, 6, 12, and 18 months23; model parameters included a common intercept, baseline DM status, and dummy coded time, and intervention arms interacted with each follow-up time point. Mean differences between each intervention group and the usual care group at 6, 12, and 18 months were calculated, along with corresponding 95% confidence intervals (CIs), using SAS ESTIMATE statements. Finally, in post hoc analyses, we created 2 subgroups of patients: (1) those whose BP was in control at baseline and (2) those whose BP was out of control at baseline. We then examined the intervention group effect on mean systolic and diastolic BPs over time within each of these subgroups using a similar model to that described in the previous subsection. To determine whether the interventions were more resource intensive than usual care in the clinic setting, we also examined differences in patients' median medical resource use and costs in the 18 months after initiating the interventions. In this analysis, we used t test and Wilcoxon test to assess whether there were intervention cost or health care use differences between the intervention groups. Of the 591 study patients, 48% were African American, 92% were male, and 59% of participants had their BP under control at baseline using standardized measurements (Table 1). No crossover among study groups occurred. No study-related adverse events occurred in any intervention group. Overall, BP measurements were available for 503 patients (85%) at 18 months of follow-up (Figure 1). Completion rates of the 18-month follow-up were similar across groups (83%-89%). The improvement in BP control relative to usual care at 12 months was statistically significant in the behavioral management group and medication management group at 12.8% (95% CI, 1.6% to 24.1%; P = .03) and 12.5% (95% CI, 1.3% to 23.6%; P = .03), respectively. The benefit in the combined intervention group was 8.3% (95% CI, −3.3% to 19.9%; P = .16) and was not statistically significant (Table 2 and Figure 2). At 18 months, only the combined intervention group showed evidence of improved BP control relative to usual care, 7.7% (95% CI, −4.1% to 19.5%; P = .20); however, the difference was not statistically significant. The largest sustained improvement for systolic BP was observed in the combined intervention group (Table 2 and Figure 3). Relative to usual care at 12 months, the mean systolic BP was 2.1 mm Hg lower (95% CI, −6.2 to 2.1 mm Hg; P = .33) in the behavioral management group, 2.4 mm Hg lower (95% CI, −6.5 to 1.7 mm Hg; P = .25) in the medication management group, and 4.3 mm Hg lower (95% CI, −8.5 to −0.2 mm Hg; P = .04) in the combined intervention group compared with the usual care group. However, by 18 months, the mean systolic BP was lower only in the medication management and combined intervention groups compared with the usual care group, but these differences were not statistically significant (−1.2 mm Hg [95% CI, −5.7 to 3.2 mm Hg], P = .58; and −3.6 mm Hg [95% CI, −8.1 to 0.9 mm Hg], P = .11). There were differences between intervention groups and usual care for diastolic BP, but they were not statistically significant (Table 2). Over half of patients enrolled, 348, had adequate control at baseline (mean systolic BP, 117.9 mm Hg; mean diastolic BP, 71.6 mm Hg) compared with 243 patients with inadequate control (mean systolic BP, 145.0 mm Hg; mean diastolic BP, 85.7 mm Hg). In post hoc analyses of these subgroups, we found that individuals with adequate BP control at baseline continued to remain in control over the 18 months of the study (Table 3). For individuals with poor BP control, systolic BP decreased in the behavioral arm by 8.3 mm Hg at 12 months (95% CI, −15.1 to −1.6 mm Hg; P = .02) compared with the decrease in the usual care group but was no longer significantly lower at 18 months. The mean systolic BP was significantly lower in the medication management arm at 12 months, −7.9 mm Hg (95% CI, −14.5 to −1.4 mm Hg; P = .02) relative to usual care. In the combined intervention arm, systolic BP decreased by 14.8 mm Hg (95% CI, −21.8 to −7.8 mm Hg; P < .001) at 12 months and 8.0 mm Hg (95% CI, −15.5 to −0.5 mm Hg; P = .04) at 18 months relative to usual care (Table 3 and Figure 4). Among those with inadequate baseline BP control, diastolic BP decreased significantly in the medication management arm by 4.2 mm Hg (95% CI, −8.3 to −0.2 mm Hg; P = .04) at 18 months compared with usual care. In the combined intervention arm, diastolic BP decreased by 5.3 mm Hg (95% CI, −9.5 to −1.2 mm Hg; P = .01) and 5.5 mm Hg (95% CI, −9.7 to −1.2 mm Hg; P = .01) at 12 and 18 months, respectively, relative to usual care. Over the 18-month intervention period, 389 of the 444 intervention patients (88%) triggered an alert for the nurse to conduct an intervention call as a result of poor BP control (eTable 2). These 389 patients activated a total number of 1945 intervention alerts. Seventy-nine (18%) activated a safety alert, while 65 (37%) activated praise calls as a result of continued BP control. In total, we referred 43 individuals 90 times for care owing to triggering safety levels. The number of alerts activated and the number of patients who generated alerts were fairly similar across the 3 intervention arms (eTable 2). Across the 3 intervention groups, 13.2 minutes was the mean time spent by nurses on each completed encounter: 12.0, 13.9, and 13.7 minutes in behavioral management, medication management, and combined intervention, respectively. Intervention costs over 18 months were $947 for behavioral management, $1275 for medication management, and $1153 for the combined intervention arm. The number of primary care and specialty care encounters over 18 months was similar for the 4 groups; the medians were 4 primary care visits for all groups (P = .21) and 5 to 6 specialty care visits (P = .12). There was no significant difference in median 18-month total VA medical cost across groups, which ranged from $5180 per patient for the medication management arm to $6910 for the behavioral intervention (P = .28). We examined the effects of a patient behavioral management intervention, medication management, and a combination of the 2 interventions delivered by telephone and activated by home BP monitoring among adults with hypertension treated in primary care. The behavioral management and medication management groups alone showed significantly improved BP control at 12 months compared with usual care. The combined intervention group demonstrated statistically significant improvement in systolic BP at 12 months relative to usual care, but this was no longer significant at 18 months.13,23 In post hoc analyses, stratified by baseline BP control, there were significant and clinically meaningful BP improvements in all 3 arms at 12 months and in the combined intervention at 18 months compared with usual care, with the largest effects in the combined intervention arm (systolic BP decrease of 8 mm Hg and diastolic BP decrease of 5.5 mm Hg at 18 months). In a review of nurse-led interventions for hypertension, nurse prescribing showed greater reductions in BP.25 In a recent Cochrane review,26 self-monitoring was associated with moderate net reduction in systolic BP and diastolic BP. Randomized controlled trials (RCTs) of educational interventions directed at patients were unlikely to be associated with large net reductions in BP by themselves. However, nurse- or pharmacist-led care may be a promising way forward, with most RCTs being associated with improved hypertension outcome.26-28 Our intervention, similar to prior work,13,23 demonstrated the potential for a nurse-led intervention to improve hypertension management in the short term and, among a carefully selected group—patients with inadequate BP at baseline—over the longer term. Overall, the behavioral and medication management intervention groups had significant improvements in BP control relative to the usual care group at 12 months; however, these findings were not sustained at 18 months. One possible explanation for these effects was that patients were receiving more aggressive medication regimens at baseline and may therefore have been less likely to benefit from medication management interventions than those prescribed fewer medications. Recent studies examining self-monitoring and telemedicine have typically involved higher socioeconomic status, lower level of intensity of baseline treatment (≤2 hypertensive drugs, whereas we had individuals prescribed as many as 4),1,2 and shorter interventions (<6 months).29-32 Thus, our study was more diverse in literacy level, education, and race/ethnicity and may be more generalizable to the larger population of male Americans with hypertension. The study has potential limitations. First, despite our inclusion criteria that patients were required to have inadequate BP control based on the average of the prior 12 months of clinic BP recordings obtained from the electronic medical record, 59% at baseline were in control using a more accurate method of assessing BP (ie, systematic assessment in a quiet room, by a trained research assistant). Thus, the discrepancy between BP values obtained in the clinic and standardized BP measurement has implications for quality indicators. We know from prior work that BP values obtained in the research setting are, on average, 8 mm Hg lower than those obtained in the clinic.33,34 It is also important to acknowledge that the home BP values, and those obtained by research staff, were lower, on average, than the values obtained in the clinic. It is difficult to tell to what degree this is a white-coat effect or some other factor. The fact that our study BPs were lower than anticipated may have hampered our ability to detect larger improvements in BP control in the overall analyses. Last, one should exercise caution in interpreting our post hoc analyses given that these analyses were not initially planned. Receiving all of one's treatment in primary care office settings may not be the optimal care strategy owing to competing issues that arise during routine office visits or due to lack of accessibility to primary care. This study addresses several of the core features of the PCMH model35 and is one of the first to examine a tailored, home-based BP monitoring used to initiate a behavioral intervention to improve hypertension adherence with a home-based hypertension medication management strategy. The intervention included nurses to facilitate non–face-to-face medication management outside the clinic setting, as well as systematic reporting back to the primary care physician, and proactively calling patients—not just relying on the clinic visit to make adjustments. None of the intervention groups increased health care use, but the cost of the interventions alone was approximately $1100 per patient over 18 months. Each intervention demonstrated improvements in BP control or systolic BP at 12 months; none of these improvements were sustained at 18 months and did not result in lower medical care costs. However, among those individuals with poor baseline BP control, the combined intervention significantly decreased systolic BP and diastolic BP at 12 and 18 months. Further work is required to identify individuals who will most benefit from this more intensive model of BP management interventions as well as to identify methods to increase or sustain initial effects obtained beyond 12 months. Correspondence: Hayden B. Bosworth, PhD, Health Services Research and Development, Durham Veterans Affairs Medical Center (152), 508 Fulton St, Durham, NC 27705 (hayden.bosworth@duke.edu). Accepted for Publication: April 8, 2011. Author Contributions: All authors had full access to all the data in the study and take responsibility for the integrity of the data and the accuracy of the data analysis. Study concept and design: Bosworth, Olsen, Van Houtven, Goldstein, and Oddone. Acquisition of data: Bosworth, Powers, McCant, Gentry, Rose, and Wang. Analysis and interpretation of data: Bosworth, Powers, Olsen, McCant, Grubber, Smith, Van Houtven, Wang, and Oddone. Drafting of the manuscript: Bosworth, Olsen, and Van Houtven. Critical revision of the manuscript for important intellectual content: Bosworth, Powers, Olsen, McCant, Grubber, Smith, Gentry, Rose, Wang, Goldstein, and Oddone. Statistical analysis: Olsen, Grubber, and Smith. Obtained funding: Bosworth and Olsen. Administrative, technical, and material support: Bosworth, Powers, McCant, Gentry, Rose, Wang, and Oddone. Study supervision: Bosworth, Powers, and Oddone. Cost analysis: Wang and Van Houtven. Analysis of data: Bosworth, Olsen, Grubber, Smith, Wang, and Van Houtven. Providing and maintaining medical management system: Goldstein. Funding/Support: This research is supported by a grant from Veterans Affairs, Health Services Research and Development (No. IIR 04-426), a career scientist award (No. RCS 08-027) and an Established Investigator Award from American Heart Association to Dr Bosworth. ATHENA-HTN development and testing was supported in part by VA Health Services Research and Development (Nos. CPI 99-275 and IMV-04-062).